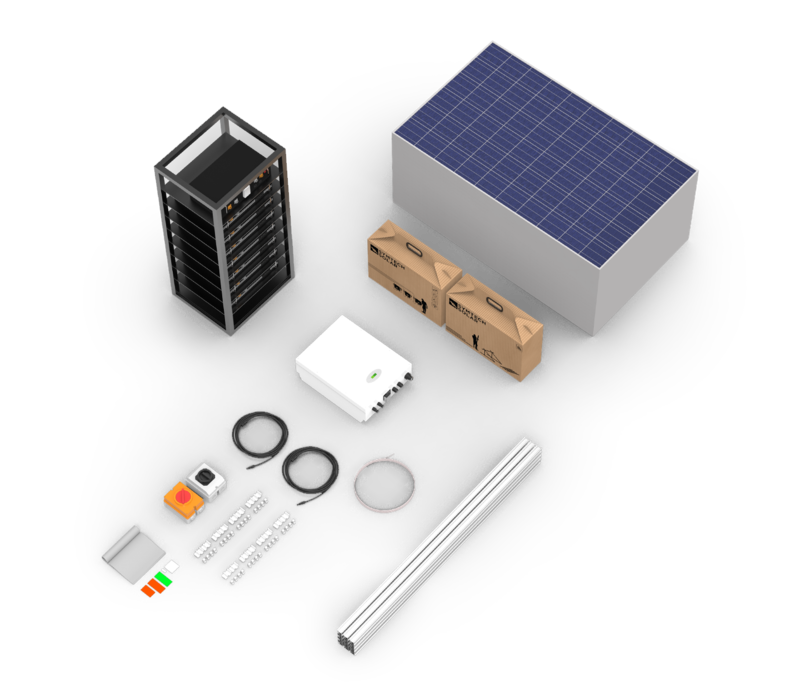 Aurora hybrid solar kits are unique in their ability to operate in either on-grid or off-grid conditions. 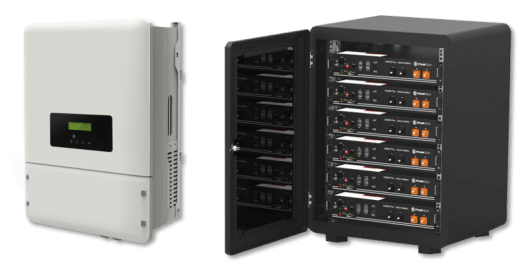 These systems include advanced BMS technology that enables users to modify the charge/discharge rate & schedules of the battery storage unit as well as to manage power consumption and PV generation usage. 1. Lithium Iron Phosphate (LiFePO4) battery packs (48V) that are series connected in high voltage DC configurations. State of the art Li-Ion batteries offers 4000 cycles and up to 80% DOD (Depth of Discharge). Each Li-Ion battery is offered in a 2.4kWh block and can be sta together in series to achieve a variety of different energy storage options. 2. Lithium Nickel Manganese Cobalt Oxide (NMC) battery packs (100V) that can be series connected up to 4 units per inverter. These Li-Ion batteries offer 6000 cycles and up to 90% DOD. Each of these Li-Ion battery units comes in one of two sizes: 4.5kWh or 6.3kWh. These can be stacked in series to make up to 18kWh’s or 25.2kWh’s per inverter. Hybrid PV Systems can be paralleled with one another up to 10 units to achieve up to 100kW’s of hybrid PV power and almost unlimited battery backup power. 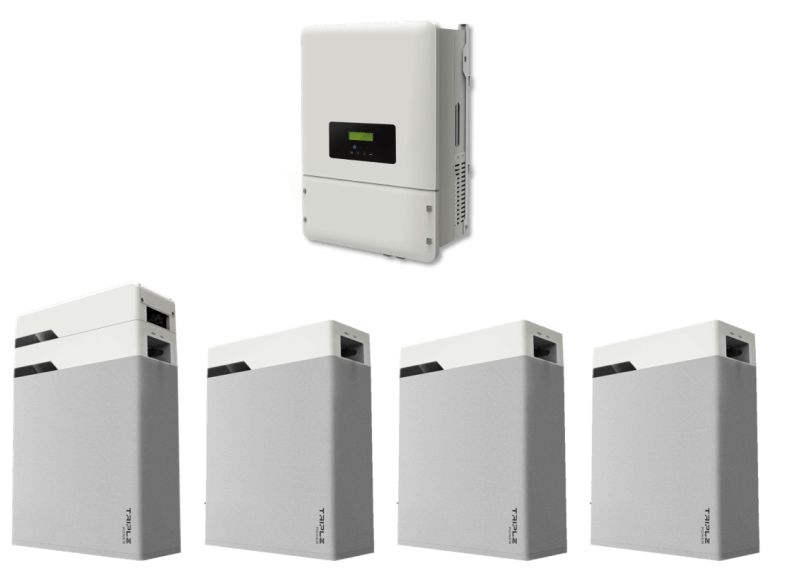 Offered in both single and three phase configurations these systems can sustain grid outages and grid brownouts making sure you always have power when you need it most. 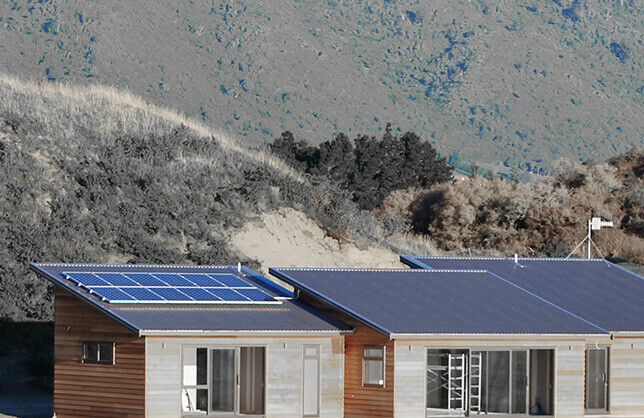 Aurora PV systems have the ability to generate and storing power at periods when electricity prices are at their highest and delivering it to the load on a scheduled time frame. Operational in both on-grid and off-grid mode, Aurora hybrid solar kits offer the highest level of 24-hour energy security on the market today. It is this powerful combination of features that makes Aurora Hybrid PV Systems one of the most valuable energy investments money can buy. Aurora hybrid solar energy storage units include state of the art Li-Ion battery banks that store and distribute sun-generated energy during grid brownouts or during high utility tariff hours. With the decreasing cost of solar PV and Li-Ion batteries, combined with increasing local incentives, solar hybrid systems have become an attractive investment opportunity for home and business owners. Our hybrid solar battery systems are available in multiple configurations and sizes and can be designed and engineered for your specific site characteristics. Each system comes fully equipt and install ready. Additional battery blocks can be added if required. State of the art Li-Ion (LiFePO4) batteries with 4000 cycles. Includes all racks and wiring & BMU. The difference is clear, get better results with our all in a box packaging solutions. Symtech Solar’s heavy-duty ISPM15 Compliant crate design not only protects the contents during international shipping but also ensures that each hybrid solar kit arrives to its destination site undamaged and ready to install. **Based on the global average electricity consumption for a 2 bedroom home being roughly 292kWh/month or 3,500 kWh/year. Your details will be kept in the form after closing it, only after processing by clicking "contact me", refreshing or changing the page new fields will be available. By clicking the "CONTACT ME", I agree that one of Symtech Solar sales representative or local distributors can call or text me via any communication platform, thanks for contacting Symtech Solar Group Limited. Thank you for inquiring Aurora PV Kits!